kann mir bitte jemand sagen warum ist be grupi 2.1.1 64bit nicht starten kann? Error: High Precision Event Timer for time measurement not found! This is mandatory for Windows 8 and higher to avoid skewed timing. in our FAQ. Open about dialog in the menu above for the link. Error: No connected and supported devices found on this system! SO I'm having an issue with uploading a screenshot of this test... Won't let me upload it to HWBOT!!! Edit: I realized I didn't have openCl or whatever, but when I download it it says my pc doesn't meet recommended settings? What is the error you have ? then verify that the GPUPI 2.1 detects the CPU, if detected, go to the test. Select the processor and run. I'm on Novice league, but i would join Rookie League, how to ? You can't, rookies is for members who registered since 3 months, then they automatically move up to novices, until they reach one year. Ok ! Thx for (fast) answer. And do you know if there are teams who accept newbies, for learning ? I'll try to contact them ! 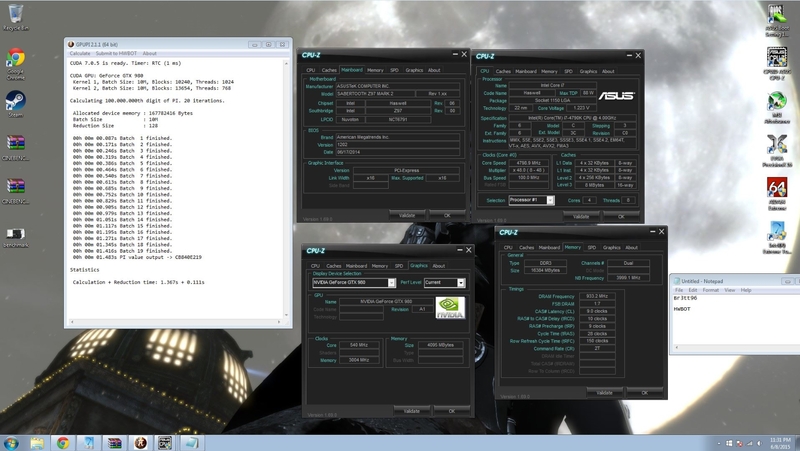 Plz check the rules per benchmark before going hard on the hardware. No Win8 or later for HWBOT prime. Also make sure your screenshots contain the needed CPU-Z tabs and that the score is visible. I'll forward it to the moderating staff.